According to Joliet Bankruptcy Lawyer, David Siegel, Joliet has always been a tough, blue-collar, hard-working town in Will County, Illinois. When times are tough in the state of Illinois, they are especially tough in Joliet. And times have been really tough lately. The housing market has not recovered in this area. The job market certainly has not recovered in this area. People are paying more for food, clothing, gas and they are taking home less. This type of climate leads one to explore other avenues of credit. These include credit cards, payday loans, title loans, unsecured loans and borrowing from friends and family. What we are looking at is a perfect storm leading to bankruptcy. If you need to file bankruptcy, rest assured that is not the end of your world. You will have the ability to recover and quickly. You will certainly have the ability to obtain credit in the future. Most likely, you will be in a much greater position financially to care for yourself and your family after filing for bankruptcy. Bankruptcy is a fresh start that the federal government determined was necessary to protect individuals and families. You can file a chapter 7 bankruptcy and eliminate miscellaneous debt provided that you don’t have significant asse ts to protect. Or you may file a chapter 13 bankruptcy and repay either all or a portion of your debt over a three to five-year period. An experienced Joliet bankruptcy lawyer will be able to sit down with you, explain your rights, explain the process and point you in the right direction for relief. Don’t be one of those people that wait forever to file, that struggle for years and years and deplete otherwise protectable assets in the process. If nothing else, learn your rights immediately. Whether or not you file is certainly up to you. It’s a personal decision. However, once you know your rights, you will be able to make an educated decision on what is best for you and your family going forward. Your family life will likely improve once you eliminate your debt. Your sense of well-being as a part of the community will improve after eliminating your debt. There is a rebirth that I see in my clients on a daily basis. Many clients send me letters stating they wish they would have found me sooner so that they could have ended their debt nightmare long before they actually did. 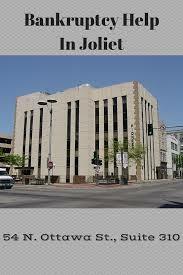 If you live in Joliet, my office is located at 54 North Ottawa St., Suite 310, Joliet, Illinois. If you contact my staff, we will set you up for an appointment time and date that works for you. 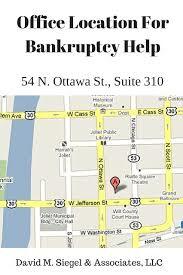 Before you hire any Joliet bankruptcy lawyer, make sure that you speak with me personally.